There are different kinds of edible mushrooms that are either cultivated of harvested wild. Mushroom hunting is popular in some countries, but it might not be completely safe. First of all, some edible mushrooms can be confused with toxic ones. Secondly, mushrooms are like a sponge, they easily absorb harmful substances from soil and air. That is why most people prefer to buy commercially cultivated mushrooms in supermarkets. 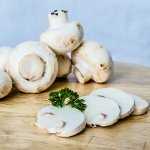 The most common cultivated edible mushroom is Agaricus bisporus also known as common mushroom, white mushroom, button mushroom, table mushroom, and champignon mushroom. Mushrooms are notable for their high nutritional value. Mushrooms are sometimes considered the “meat” of vegetable world due to high protein content, although they are not vegetables. They also contain B vitamins, vitamin C, potassium, phosphorus, calcium, sodium, and zinc. Mushrooms are able to produce vitamin D when exposed to sunlight. To celebrate the National Mushroom Day, learn a new mushroom recipe and surprise your family with a tasty meal.